The infant (and lopsided) universe. This image, which was spread across four columns of the front page of Friday's New York Times, is of the universe (our universe, for you multiverse fans) at an age of about 380,000 years. In terms of human lifespan, this is but a microsecond after birth. 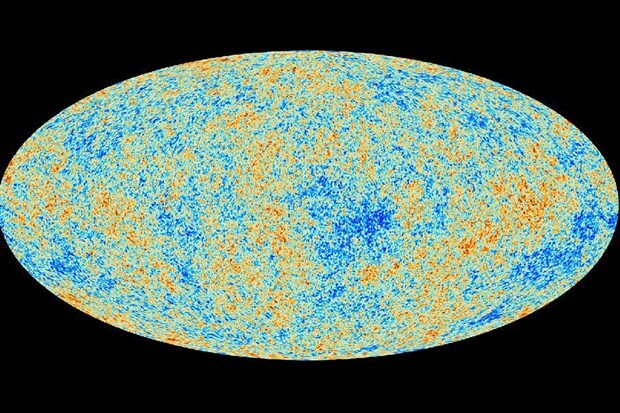 Indeed, this image enabled scientists to estimate the age of the universe with more precision than before: about 13.82 billion years old. The image comes from the European Space Agency's Planck spacecraft, built to to provide the best images yet of the cosmic microwave background radiation, our memoir of the Big Bang. What's especially significant about this image, according to this Slate blog post by Phil Plait, is that it shows the young universe to be slightly asymmetrical. Note the concentration of brightness at the right of the image above. According to Plait, this could just mean that "dark energy" (which Planck's measurements tell us makes up 68.3 percent of the universe) is changing over time or, more excitingly, that "we’re seeing some pattern imprinted on the Universe from before the Big Bang." Vivaldi, "Spring," from The Four Seasons. From a conservatory in the National Botanical Gardens of Wales, the Academy of St. Martin in the Fields performs what is perhaps Antonio Vivaldi's best known piece, featuring Julia Fischer on violin. 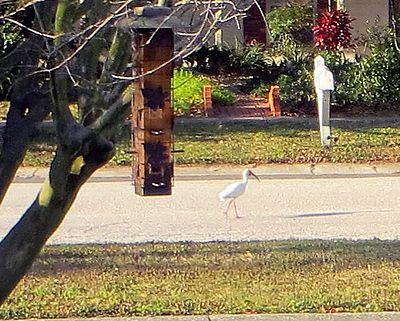 Why did the white ibis cross the road? (A) Julene was giving her secret ibis call. (C) Better bugs on the other side. (D) To get away from that scary guy with the camera. Update: My daughter was right! She said this was an ibis, and I thought it was a cattle egret. I looked at photos of both birds online, and they seemed to confirm my identification. But friend and avian expert John Hunt weighed in on my daughter's side, so I've corrected the post. The Clancy Brothers and Tommy Makem, "Brennan on the Moor." How do you tell an Englishman from an Irishman? It's in how they propose marriage. An Englishman says, "Dahling, I love you. Will you marry me?" But an Irishman says, "Mary, how would you like to be buried with my people?"